Screed is one of the more “anonymous” elements of a building. That’s rather unfortunate, as flooring requires not only a lot of know-how but also robust materials that can be laid quickly. LANXESS’ calcium sulfate binder is great on both counts, In addition, it does not cause the problems that are associated with many cement screeds. This reliable and versatile binder, which is also known as “anhydrite,” began to spread rapidly in the flooring sector 50 years ago, in 1961. 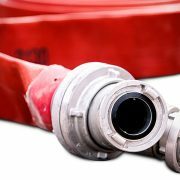 “You can tell some materials are durable just by looking at them,” says Michael Witte, Marketing Director for Anhydrite at LANXESS’ Advanced Industrial Intermediates business unit. “However, very few people ever actually get to see our calcium sulfate binder.” But what’s calcium sulfate, we ask. In response, Witte smiles and points at the floor. However, you’d have to remove the parquet flooring in order to see what he’s referring to. But then again, it might be covered by carpeting or by tiles, depending on where the floor is located. That’s because the calcium sulfate is deeper down in the floor. Although the area underneath our carpeting or ceramic tiles is invisible, screed has to endure a lot of strain. It has to support a lot of weight, for example, and withstand such loads for many decades. The standards that have to be met in this regard are very tough. In addition, the screed should only be minimally distorted by heat — which is an important consideration for underfloor heating systems, for example. What’s more, the material should set as quickly as possible so that the floor can be stepped on soon after the screed layers pack away their tools. Time is money, after all — today more than ever before. For screed experts, the most exciting aspect of the high-performance screed binding material is that its shrinkage and expansion values are less than 0.1 millimeters per meter. These are ideal values that cement screeds generally do not get anywhere near. This dimensional stability is the reason why screeds made of calcium sulfate binders are especially suited for the laying of large continuous areas without any joints. That’s because a floor that is less prone to expansion and contraction needs fewer joints — it’s that simple. As a result, the patterns created by tiled floors, for example, aren’t interrupted by annoying joints. Calcium sulfate binders also dry rapidly and become very strong relatively quickly. Under good conditions, they can therefore be stepped on and subjected to loads within a few days. Many screed experts also prefer calcium sulfate binders to cement screeds because they generate far fewer typical customer complaints regarding buckling or settling at the edges. 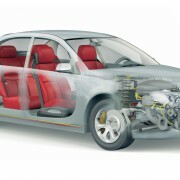 With chemistry know-how, the high-performance binder can be fine-tuned to deliver even more benefits. 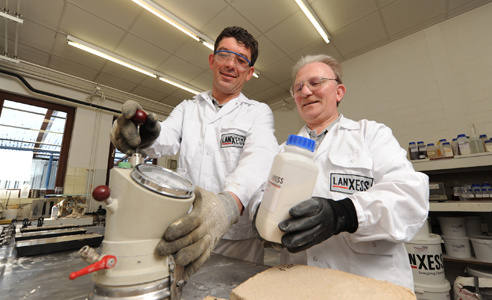 The anhydrite team from LANXESS provides additives that boost mechanical properties such as the compressive strength and strength in flexure, for example. That’s important for industrial screed in warehouses, for instance, where there are not only shelving systems that weigh many tons but also gigantic forklifts driving around. Other additives make it easier to pump and pack “earth-moist” mortar. There’s no need to add more water, since mortar that’s excessively moist needs more time to dry. Precise, robust, and fast — someone could well have written that in the “family register” about the harmless-looking powder 50 years ago. In any case, the material enjoyed a very rapid rise to success right from the start. Chemists and engineers noticed back in 1961 that the rotary kiln of their hydrofluoric acid plant was producing a very exciting material — the extremely pure calcium sulfate called “anhydrite.” Soon thereafter, they began to market the light-colored, bone-dry material as a binding agent for calcium sulfate screeds. It was pioneering work in an area of application that is still developing strongly to this day. The calcium sulfate binder very quickly became the dominant product in its category. 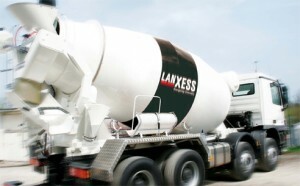 In the past five decades, screed layers have used a whopping six million tons of calcium sulfate binder from LANXESS. That’s enough to provide a robust floor surface for a total area of 240 million square meters, which is equivalent to the combined floor space of two million one-family houses. The material used to be transported to its users primarily by ship. This is one reason that about 20 percent of all the floors in buildings in Germany’s Rhine-Main region (measured in square meters) are made with conventional calcium sulfate screed. Today, of course, the material is also available in other regions, and has been for a long time. CAB 30 is a success story in Germany, Austria, France, and Switzerland. And the use of calcium sulfate screed is increasing, because architects everywhere wish to avoid the problems that are typical of cement screeds. 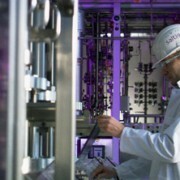 The chemists in Leverkusen understood back then that anhydrite was the solution to many challenges in the screed business, and their observation has paid off: “Today we are the biggest supplier of the bagged calcium sulfate binder CAB 30 for the production of conventional calcium sulfate screeds,” says Witte with pride. “Screed companies today naturally want extensive technical support that will help them to achieve the best results,” says Witte. “This is why we organize regularly scheduled training courses for customers and dealers, advise our customers concerning all questions related to the product’s use, and offer practical assistance at construction sites — for example, by taking samples and performing product quality checks.” And at www.anhydrit.de, planners and users will find a wealth of useful literature and planning tips. “Other important issues are health protection and sustainability,” Witte says. The calcium sulfate binder is also scoring points in this regard. 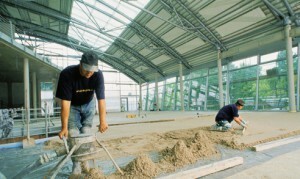 “We have had screeds with our calcium sulfate binders and additives evaluated by the Fraunhofer Institute for Building Physics IBP in Stuttgart and in line with the specifications of the Committee for Health-related Evaluation of Building Products (AgBB).” The results show that the tested screeds release far lower levels of volatile organic compounds (VOC) than those permitted by the AgBB. So they have no problem meeting strict health protection requirements. Witte and his colleagues are also rejuvenating their range of additives. 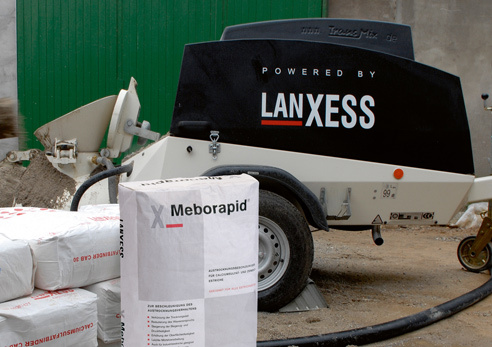 “Our latest addition to the family is a new, highly effective drying accelerator for conventionally placed calcium sulfate screeds with the brand name Mebofix,” he says. This additive makes it possible to dry screeds more than 50 percent faster than is usually the case. After its use, you can walk on freshly placed screeds after just two days. Under the right conditions, a floor 40 mm thick can then be dry even after one week. 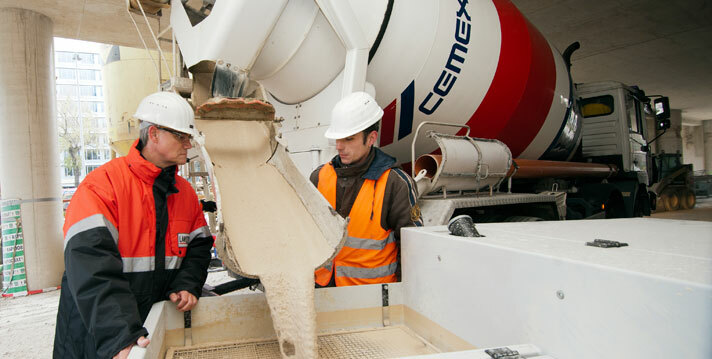 “This puts calcium sulfate binders almost into the category of fast-setting cements, which are much more costly as a rule,” Witte points out. The fact that less water is used in the mortar also makes the screed more robust, so Mebofix also increases the floor’s compressive strength, strength in flexure, and surface strength. La química hace posible la movilidad ¡La movilidad del futuro es verde!